Please contact us with any question or comment you may have. Click here for answers to our most frequently asked questions. If you're looking to sell an object or get more information on something you own please read the FAQ before contacting us. We invite you to select your areas of interest and to be as detailed and specific as possible to allow us to better answer your requests. WE ARE ALWAYS SEEKING TO BUY FINE QUALITY MARINE ART! We are generally in the showroom Tuesdays and Fridays from 10:30am to 6:00pm. Please call before coming to ensure we are there to meet you. Turn North onto Newport Blvd., in about 1.3 miles turn left onto 17th Street. In about 1/3rd mile, at the second intersection, turn right onto Pomona Ave.. In about 100 feet turn right into the first driveway, we are in the building on your right, unit E5. You will see our sign, "Vallejo Fine Marine". Go to the door next to the capstan and ring the doorbell for entry. Take the 55 Freeway until it ends into Newport Blvd. After the freeway in about half a mile, turn right onto 17th Street. In about 1/3rd mile, at the second intersection, turn right onto Pomona Ave. In about 100 feet turn right into the first driveway, we are in the building on your right, unit E5. 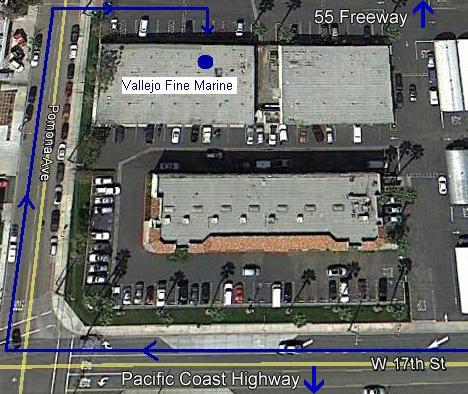 You will see our sign, "Vallejo Fine Marine". Go to the door next to the capstan and ring the doorbell for entry.